The Plundertaker (Praedam libitinarius) is a boss-monster. Like many dungeon creatures, the Plundertaker was created during a sampling of a medical herb, recently leagalized, by a bunch of wizards leleading sheltered lives in their fortress-school-castle. 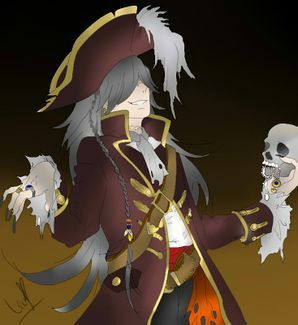 The Plundertaker is the undead form of a legendary pirate captain who, supposedly, sold his soul to the devil, something the naive wizards knew nothing about. Having terrified, plundered and murdered the living during his lifetime, he not only continues this course after death, but has the power to force those he kills to join his undead pirate crew. The nimble boss has frightening abilities at his disposal to injure heroes twice, fire fire-balls and steal loot, of course. This page was last edited on 2 February 2019, at 01:50.